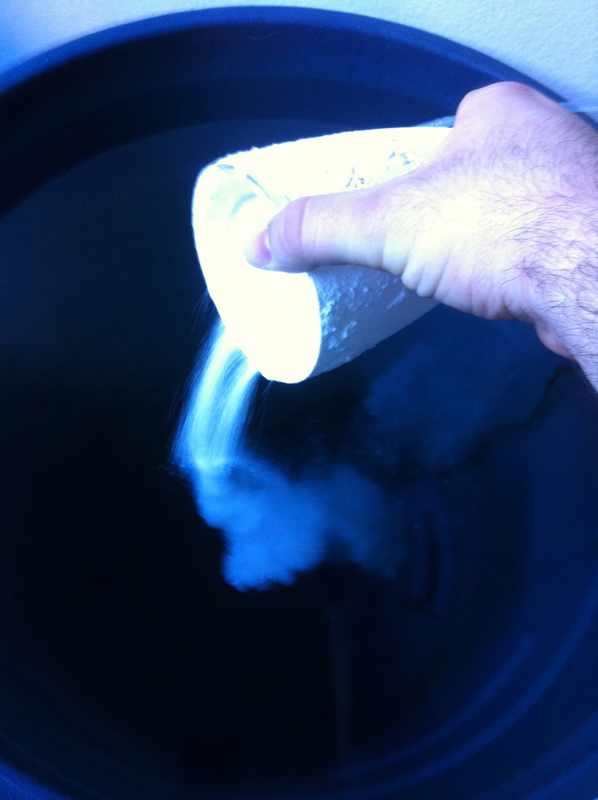 You might recall our hands on review of the aquavitro salinity salt mix from Seachem. We performed a rather large water change with the salt on our frag system, and were immediately impressed with the results. The salt mixed up very clearly, left zero residue in the mixing container, and left our aquarium looking very clear after the water change. Well, we’ve started yet another water change (2-weeks to the day from the last one), and so far the salt is performing just as well as the first batch we mixed. And while preparing for the change, I wanted to test the alkalinity and see how it measured up to Seachem’s claim, which is stamped on the back of the bucket. Seachem claims the salt mixes to an alkalinity of 3.2 meg/L, which is around 8.96 dKH. We tested the water with a Tropic Marin alkalinity test kit, and got a reading of 8.5 dKH, or around 3.03 meg/L. To me, this reading is spot on with what Seachem guarantees in their analysis. You have to assume there will be some fluctuation in the readings due the the limited accuracies of titration-based test kits, as well as the length of time the salt has been mixing. As for other parameter tests, we’re still working on those. I would like to test calcium and magnesium in the very near future, and have no plans of testing pH. Testing for pH, in my opinion, is really rather pointless. The slightest things in the atmosphere can alter pH, including time of day, temperature, and even the amount of air circulation you have in the room where the salt is being mixed. So, we’ll keep our hands out of that, and instead focus on tests that will give us more tangible results.